Please have patience, the virtual tour takes a moment to load. The Lodge is located in the beautiful Magaliesberg Biosphere. On the shores of the Hartbeespoort Dam. With stunning views over the Dam. Tucked away in the secure picturesque village of Kosmos. Most Suites have a private terrace with braai facilities. The lodge offers various levels of comfortable accommodation. From budget suites for wedding guests wanting quick in quick out accommodation. To luxury romantic suites with spa baths and fire places in winter. The lodge also has a salt water rock pool to cool off in. A privately located outside jacuzzi is available to all guests during the summer months. There is a guest lounge with full DSTV functionality for soapie or sports orientated guests. The kitchen in the guest lounge is mainley stocked with plates and cutlery for your Braai. The owners Ingrid and Will are on site to assist with special requests. This suite is R 450.00 per person per night. Breakfast is an optional extra of R 75.00 per person. This is our more private - compact accommodation. Ideal for wedding guests quick in quick out. It has a garden with Indonesian Gazibo, and a deck with braai facilities. Facilities: Bar Fridge with Coffee/Tea tray. This is our family suite. It has a loft room with 2 single beds. A fireplace keeps you warm in winter. It has fantastic views, from a large deck. The bathroom has a bath with hand shower and a bidet. Breakfast is on optional extra of R 70.00 per person. This suite is R 500.00 per person per night. A R 50.00 surcharge will be levied per person for a single night stay. The Yellowgrape Suite has twin beds (which can become a king size bed) and an ensuite bathroom with bath and shower. On a clear day you can see forever. This suite is R 495.00 per person per night. The Greenbird Suite has a queen size bed and ensuite bathroom with bath and shower, a private patio and never ending views. There is a ceramic fireplace for romantic evenings. This Indonesian style Suite overlooks the dam. The ensuite bathroom has a rain shower plus an outside shower, and a spa bath. French doors open onto the terrace under the trees with a braai. It has a lounge area with a ceramic fireplace. This Site is R 750.00 per person per night. This is R 725.00 per person per night. Hidden behind waving palms, the Palm Suite is decorated in Indonesian style. Overlooking the Hartbeespoort dam, the suite has a private Jacuzzi, a double shower, and a fireplace for colder nights. This suite is R 675.00 per person per night. Minimum booking 2 nights on weekends. This is R 610.00 per person per night. This Indonesian style Suite overlooks the pool and dam. French doors open onto the terrace under the trees. It has a lounge area with a ceramic fireplace. Started the Lodge 20 Years Ago. After 20 years of service this is what we are so proud of. good for us. We are now eady to sell theLodge, and let a younger couple takeover. interestyed ? 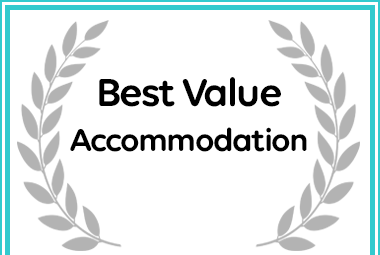 Afristay has named Willinga Lodge as a Best Value Hartbeespoort Destination. The Island Suite has a private terrace with outside shower. A private Jacuzzi overlooks the dam. A ceramic fireplace is built in for colder nights. This suite is R 425.00 per person per night.